In the early years of the 20th century, the trees of Buffalo, New York were being decimated by the voracious white-marked Tussock Moth caterpillars. 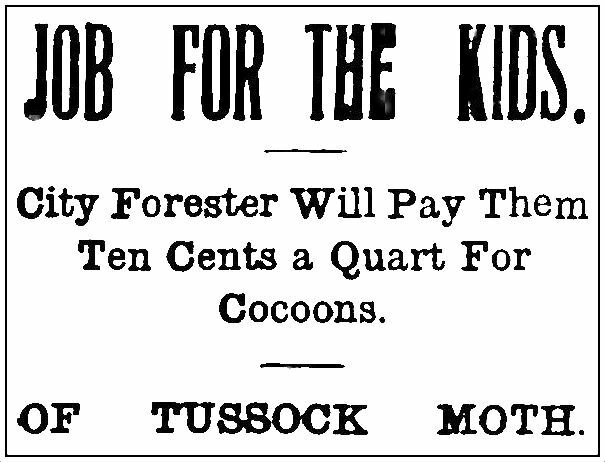 H. B. Filer, the head of the city’s Forestry Department came up with a novel way of attacking the problem: pay children to collect cocoons/”egg masses” for a princely bounty of ten cents a quart (the equivalent in today’s money of about $2.50). Not only would huge numbers of the destructive pests be rounded up and destroyed, but kids with an entrepreneurial spirit and a willingness to scrape cocoons off trees, walls, and posts and insert their small hands into tiny hollows and crevices could make a nice chunk of change during the summer weeks that the cash-for-cocoons campaign was in full swing. The photo above shows eager, barefooted children cashing in their quarry in a Buffalo park. 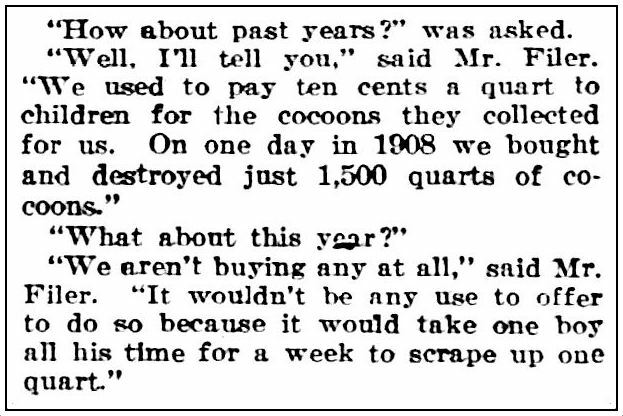 In an article about the effectiveness of this novel plan to help the city’s foliage, it’s stated that a total of 60,000 quarts was turned in … in one month. That seems high — it might have been a total of 60,000 quarts over the three years the campaign was held each August, between 1908 and 1910. But who knows? Kids can really get behind something like this, especially if they can walk away with enough money to keep themselves on a perpetual sugar-high after purchasing large quantities of penny candy and big swirly lollipops. So how successful was this idea of sending an army of children out into Buffalo’s neighborhoods in search of cocoons? Let’s just take that 60,000-quart number. It’s estimated that that would mean that three billion (!) caterpillars were prevented from chomping their way through Buffalo’s trees. That’s a lot of danged caterpillars. 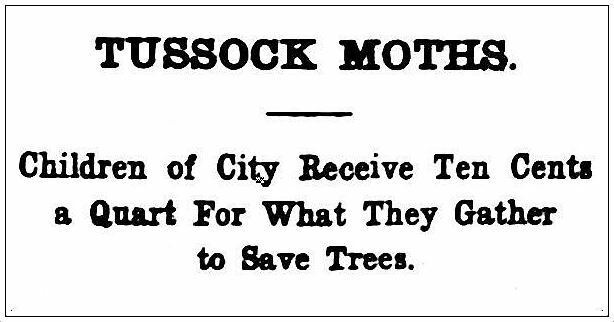 Photo from the article “Work of Buffalo’s Forestry Department” by City Forester H. B. Filer, which appeared in the Jan. 25, 1911 issue of Municipal Journal and Engineer; see the full article and other photos, via Google Books, here. This entry was posted in 1900s, Children, USA: New York and tagged Cocoons, Tussock Moths. Bookmark the permalink.